Unity Days 2018 not only gave me insights on all my favorite characters from The 100, it also helped me learn a few lessons about the nature of fandom itself. Last weekend, I had the opportunity to spend three full days celebrating how much I love The 100 with a bunch of my closest friends, hundreds of other fans, and members of the cast and crew. Fellow Hypable writer and resident The 100 expert Selina Wilken recently gave a fantastic and thorough rundown of what it was like Celebrating The 100 fandom at Unity Days 2018, and I highly suggest you read her article to get a full picture of what it was like to experience this entire weekend. For me, I came out of this weekend not just with a greater appreciation of the show — although there was that, too — but with greater insight and more gratitude for the power and possibility of both television storytelling and fandom in general. I love The 100. And I love fandom. But I haven’t always loved The 100 fandom. It’s not that it’s necessarily worse than any other fandoms that I’ve been apart of, it’s far from that. After all, I’m old enough to have witnessed the shipper wars in the Harry Potter fandom circa 2000-2003ish and was a member of any number of locked LiveJournal communities back in the day. Still, I’ve both borne witness to and been victim of a fair share of fandom drama in the last few years — enough that I was a little worried about what an in-person convention might be like. Yet despite all the ship wars and tumblr vague posting and angry tweet threads that I’ve seen floating around in my last two years as a member of this fandom, I saw exactly none of that the entire time I was at Unity Days. People spoke about their different ships with grace and understanding, talked about their favorite characters and story arcs without it devolving into a weird competition over who was the most morally upstanding citizen. People offered up varying — sometimes even controversial — opinions about different aspects of the show, and everyone was ok with agreeing to disagree. And despite feeling like I’ve spent the entire last year online defending Octavia (and sometimes Marie Avgeropoulos as a person) from hordes of people calling for her death, Marie Avgeropoulos had by far the longest autograph line of the entire convention. So even though it’s easy to get lost in the tumult of Twitter or the chaos of Tumblr “discourse,” this weekend was a good reminder that even with the increasing influence of press and the rising importance of social media, the online world is not a reflection of reality. As an individual, I was able to chat and connect with individuals I might never follow on social media simply because of how differently we experience the show on paper (or online, as it were). I had the opportunity to hear, appreciate and respond to opposing points of view without worrying that I’d end up with a rude anon in my Tumblr inbox. And as a fandom, we were able to raise over $11,000 towards a charitable cause (shoutout to Jo Garfein for not only running a great auction, but for her wonderful powers of moderation during the panels). Yes, the anonymity of the online sphere can highlight the very worst of fandom, but these in person fan conventions do a great job of reminding us all of the very best of it and I’m so very thankful for that. I guess this should’ve been fairly obvious, but never having been to a fan convention, I just wasn’t really sure what to expect. I suppose, too, I probably approached the whole experience with more than a little skepticism — perhaps even cynicism. 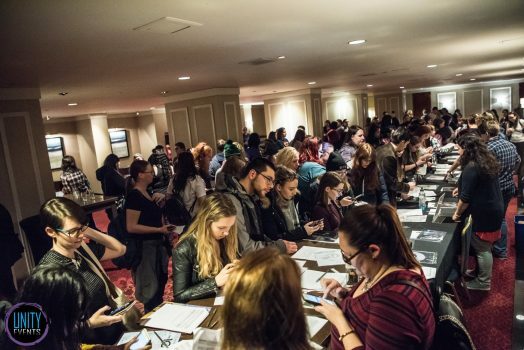 I thought photo ops and autographs would be little more than an assembly line affair designed to get us in and out as quickly as possible, couldn’t fully understand the appeal of panels in an age when all the best information finds its way online almost immediately. But what I didn’t fully realize then that I realize now is that The 100 isn’t just a job for the actors and writers and crew members, no more than it is just an easy way to pass an hour a week for those of us who are fans. Just as the characters and the storylines of The 100 represents something deeper for the fans — an escape from reality, an assurance that we aren’t alone in what we’re going through, a way to think deeply about complex issues (or some combination of all these things) — it likewise represents those same things for the cast and crew that are involved. 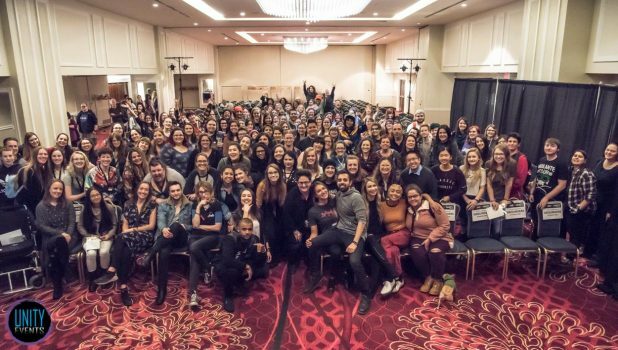 Fans and cast and crew alike were at Unity Days to celebrate something that they loved — and to celebrate it by being in community with other people who love it, by sharing just what exactly The 100 means to them. Yes, you could easily get a quick rundown on Twitter of all the cut and dry information from the panels, but you miss out on all the jokes and emotions and interactions that you can only get by being in a room. It was so obvious in every panel with cast and crew alike how deeply each member of this show thought about their character or their job, how much they loved bringing this world to life. There’s something really amazing about being able to have what feels like an intimate conversation about life and death and the ramifications of difficult decisions when you’re in a ballroom with hundreds of other people around you. Likewise, each photo op and autograph session and even selfie felt personalized and important. All the actors really made sure to take their time and talk with you about whatever gift you may be giving them, whatever headcanon you wanted to discuss with them, whatever random story you decided you wanted to tell them. It was just so obvious, again, even in these limited one on one interactions, that each of the cast members wanted to sit and share in your emotions and experiences about their character and about this show. I have a new appreciation for the power of fan conventions thanks to going to this one,and I just want to end this by not only thanking the lovely cast and crew of The 100, but also — and especially — to all those involved in putting it all together: Leana Santos, Miah Bannerman and the entire Unity Events team. You all are the true MVPs of this weekend, and I hope that we get to do it all again for Unity Days 3!